Dave woke me up the earliest of the lot, at 7AM I believe... As there’d be five of us going to the track in one vehicle today; ‘Whale as close to the track as we could get parking-wise before hoofing it in the remainder of the way from Dave’s super “SECRET” parking spot. As I really don’t recall much anymore ‘bout race day other than it was H-O-T! It was so DAMN HOT that we did the unthinkable and went for breakfast inside the Brickyard Crossing restaurante simply to seek the shelter of AC as long as possible before going outside into the inferno! Seem to recall that everybody stood up for the race’s pace laps and we did get to see Bryan Herta do a solo lap in Wheldon’s Twenty Oh eleven winner, which was kOOL! As opposed to being cool, since the only thingy remotely C-O-O-L was the FROZEN water bottles Dave had brought for us - which remarkably were so FROZEN that it took forever for the ICE to melt; YIKES! HOLY ICECUBES BATMAN! ‘whale actually it was just the first 31-cars that looked like a multi-coloured rainbow to my ‘Jellybean vision, as I could actually make out the last two cars - with the two ‘Luddi’s running alone and even got more excited as I could make out the solitary black Dallara DW12 chassis of Alesi’s Fan Force United car versus Simona de Silvestro’s multi-green racecar, which contrary to popular belief wasn’t glowing in the dark; Hya! And although a fan of Simona’s, I was rootin’ instead for Alesi, Dr. Who and the Fan Force Boyz to win the intra-engine duel between these two slow moving Loti’s, albeit I think Alesi was running stone last? And I think first ‘Symona-symona was forced to retire and then Alesi’s car vanished too - as they’d both been black flagged due to not being fast enough on track, which in a nutshell was the Bain of the Lotus experiment, eh? Another noticeable cue to Mwah, albeit of a different sort of sensory mode came in the forms of audible and smell to me, as first off it was amazing how ghostly silent Mother Speedway became when a full course caution was thrown and all of the whump- whump- whump- whump- whump- whumpp passing noise of the gynormous IndyCar Freightrain dissipated. Yet even more distinct was the almost cloudlike wafting of burnt, shredded, blistered ‘Flinstone rubber passing overhead some thirty seconds plus after the ensuing accident had occurred - as the track was silent with nobody at speed on the track’s backside and NO cars to be seen whilst awaiting the unwanted tow hook! But I know I did a little Happy dance when ‘BULLY-RAY’S ‘CHEBBIE DONE BLOWN UP! Ah, poor Hunter-Reay, who was my new Number-1 villain last year, as I’ve begrudgingly admitted the lad’s got talent, especially how he persevered over Will Power for the title last year; as so far this season I simply don’t have any HATE! To which I know ‘R’s (Robin Miller) motto is “Hate is Good!” But I just feel like the steam’s gone outta Mwah and nobody’s really done anything super devious yet. Hmm? May be the gloves will come off either in Detroit or Toronto? And I do remember how GEEKED! The entire crowd got over ‘FAST EDDIE’s mesmerizing March to the front, as I believe he got as high as P3 before looping it against the wall, and hence scratch off another candidate for the little guys done good category. 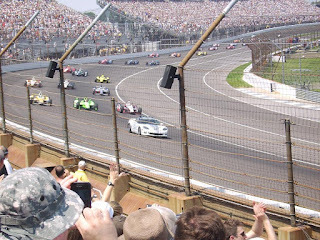 Another time the cavernous Speedway grandstands erupted was when the wily ‘TK Follow-your-Schnoz (Kanaan) lit his afterburner and sliced ‘N diced his way from fifth to P1 on one of the countless restarts; Aye Karumba! And then there was the final lap, with everybody on their feet going OOH, AHHH!!! As you could audibly hear the proverbial air going out of the bag when Takuma Sato crashed upon making his ultra daring pass for the lead upon Dario... who in the past I’d taken to calling him Dashley LePew and even going so far to comically propose his boss the ‘Cheepster adding SaazAll as a sponsor to the No. 10 car after Dario had moaned over Justin Wilson’s “unfair” victory at Texas - where Franchitti quipped he’d saw off certain parts of his anatomy to get the weight savings that thee ‘B-I-G UNIT’s chassis had afforded him... Oh Dashley, put a cork in I-T wills Yuhs! Afterwards, upon finally meeting up with the three Hosers, I cannot even begin telling Y’all how DAMN GOOD those ice cold Bud’s tasted as we sat inside the Brickyard Crossing once again letting the crowd die down somewhat before finally making our way back to CARPETZ MANOR for the traditional Sunday Night Feast! And that’s my very eclectic recap of last year’s race, as I’ll try pooundin’ I-T out a little bit sooner then one year later - as it was scary trying to remember A-L-L of the past two year’s races just prior to leaving for Indy this May; CRIKEYS! Thus, you can get a blow-by-blow recap written by thee ‘Dom ‘O IndyCar bloggers; DAMN YOU ‘DAWG! Why do you have to be so observant; Hya! Although I bet it wasn’t nearly as H-O-T at the ‘DAWG’s Man Cave, eh? With Bill’s beer ‘O choice and his AC cranked on, right Bill? And that’s about the entire riveting minutia I can think of - as it was another typically bumpy, frumpy unenjoyable flight home, as I don’t even recall which way I went? As I seem to end up with a different route each way every time I go to Indy. 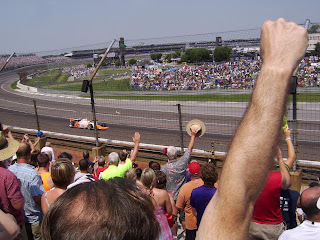 Yet I was happy that I got to see ‘Rubino’s debutant Ovaltrack race, NO less at Indianapolis, as I believe Barrichello was the Rookie Of the Year? Thus, what surprises ‘N tidbits will this year’s race produce, huh? Guess we’ll all find out shortly, as now I’d better go pack my suitcase, eh?